Our feature set includes service hour logging and program, volunteer and site management. Click each feature to read more! Volunteer management functions support administration of AmeriCorps members, service-learning students, and community volunteers. My Service Log encourages direct volunteer access with password-protected user accounts to reduce administrative data entry. Volunteer profiles record detailed and customizeable contact, demographic, documentation and criminal background check information. Volunteers can update their contact and personal information in the system, including emergency contact information, saving administrative time. Programs can effectively reflect volunteers’ progression through enrollment, term of service and exit with numerous status designations and detailed status histories. Directories of service sites, service positions and contacts allow programs to record organizational details, contact information and position descriptions. Service positions are created at service sites, and can be locked to a volunteer or made generally available. Site supervisors can be designated for each position from the directory of contacts at a service site. Recurring service positions can be moved forward through time, eliminating duplicate input. Optionally, licensees may allow volunteers to input their own service positions. Service agreements optionally link volunteers to primary service positions, serving as a central connection point between service positions, volunteers, hour logs, and service accomplishments. Agreements promote volunteer development and introspection by encouraging consideration of service and learning goals. 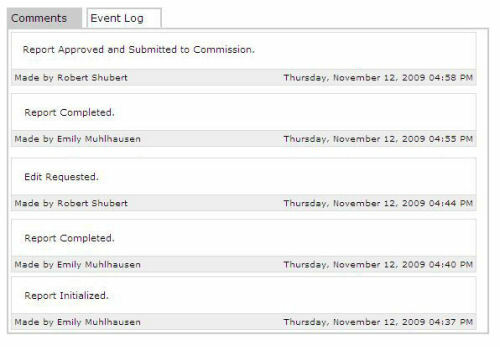 Creation of training events allows volunteers to log training hours and programs to track event attendance. Optionally, licensees may allow volunteers to input their own training events. volunteers can log hours against service agreements, service positions, or training events, allowing detailed volunteer activity tracking and reporting. Timesheets can be electronically approved, printed with signature lines, or signed online. Service accomplishments track service activities and demographics including beneficiaries of service, number served and issue areas. Accomplishments promote volunteer introspection by encouraging reflection on the results of their service. My Service Log provides a multi-tiered administrative structure for the effective management of service programs. Volunteers and their service sites are grouped into programs - representing different offices, affiliates, campuses or geographic locations - which are administrated by the My Service Log licensee. Numerous permission levels provide varying levels of user access and system functions. Security is strictly controlled to ensure that appropriate users access only permitted data. To assist staff and administrators in helping their volunteers use the system, all volunteer accessible areas can be directly viewed by staff. Each staff volunteer can belong to one or more Roles which in turn ensure that email notifications are sent to the appropriate recipients. Automatic email notifications can be set to trigger when certain criteria are met. For example, an email may be generated to volunteers who did not submit hours the previous week or month, reminding them to do so. A robust commenting system promotes intra-system communication between volunteers and staff and provides a record of interactions. An event log tracks user actions on system pages, enhancing accountability and transparency. The electronic signature module allows licensees to collect valid signatures on forms and data in My Service Log electronically, simplifying workflow and eliminating the need for printing and paper storage. Licensees can specify the user permission types that can sign each kind of system information. The “Print to PDF” feature allows volunteers and staff to print timesheets, agreements, reports and more to Abobe’s industry standard Portable Document Format; the most widely accepted format for transferring documents between computer systems regardless of platform or capabilities. This provides a convenient method to print, email and archive service logs, reports and other system data. A comprehensive trouble ticketing or ‘case management’ system allows licensees to identify problems with volunteers’ enrollment, exit, timesheets and more and automatically notify the volunteer and program administrator(s) when a case is initiated. Licensees and programs can review all open cases and update cases with comments, which also triggers email notifications. My Service Log provides tailored tools for AmeriCorps grantees and state commissions to manage members, track service hours, and administrate programs and sub-grantees. Mid- and end-term AmeriCorps member evaluations allow programs to assess members’ performance, track improvement, and identify problems with fully customizable evaluation questionnaires. Grant management features allow AmeriCorps administrators to set and modify grantee slot assignments by enrollment type. Enrollment History reports show slot usage by program. Custom report dates allow Commissions to specify reporting periods and set due dates, and automatic email notifications remind grantees to complete and submit reports. Reports accumulate across reporting periods, creating ‘living documents’ on which grantees can build. Year-to-date totals for quantitative report fields and cumulative text replies help grantees provide accurate and pertinent data while avoiding repetition and multiple report management. Workflow options allow grantee staff to electronically submit reports to grantee administrators for comment and approval, then submit completed reports to Commission staff. Databased comments and action logs provide accountability and facilitate communication. Aggregation of grantee reports simplifies CNCS reporting and data collection. Grantee budgets designated at the Commission level are reflected in Periodic Expense Reports, reducing administrative error. Optional tracking of in-kind budget and expenses allows more accurate financial reporting. Expense data collected in the Periodic Expense Reports rolls up into Federal Financial Reports. Fully customizable Progress Reports streamline Commission data collection and reporting. Design tailored forms for your sub-grantees by selecting relevant reporting fields and customizing question texts – even create new questions as your reporting evolves. My Service Log provides customization features that tune the system to your organization's specific needs, including custom terminology, feature preferences and customizeable system screens and forms. Interface customization features allow licensees and programs to maintain unique identities with customizable colors, banners and images. Licensees can modify many specific CSS settings for a truly custom look, while programs have a streamlined color-palette tool to easily change the colors of the site. Administrative control options give licensees the power to fully customize system data entry forms- like volunteer profiles and position descriptions- by removing unnecessary fields and changing field names for a truly relevant and tailored data set. Lists management provides licensees the ability to customize AmeriCorps enrollment types, case management problem categories, issue areas and more; control the contents of nearly every system pull-down menu. 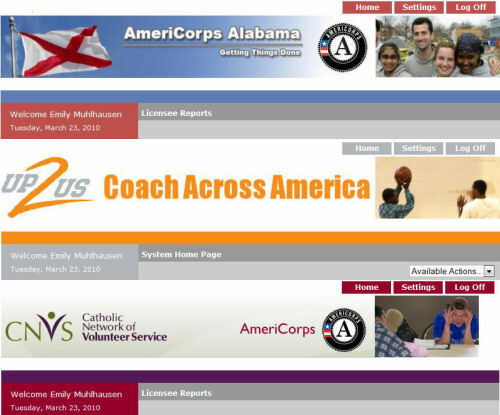 Each licensee and program receives a unique URL for volunteer and staff login using the ‘myservicelog.org’ domain name, or licensees can choose a custom domain. My Service Log can operate on an academic (semester) or grant/program year calendar. Each licensee can designate their semester structure or the first month of their grant year. Programs can use or, optionally, override this default.